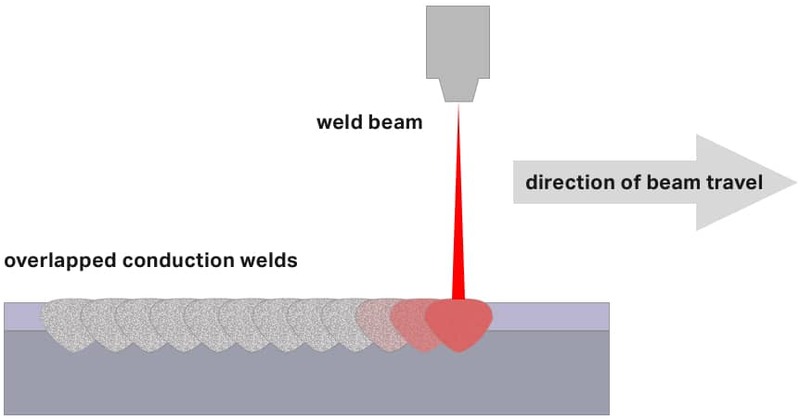 High energy beam welders – electron beam or laser beam welders, are capable of welding in different modes, depending on power settings, feed speeds, and the focusing of the beam itself. Principally, the two modes are conduction and keyhole, and each produce very different welds with different characteristics. Which is best depends on the specifics of an application. A Conduction mode weld is achieved using lower power and a relatively low energy density. The resulting weld is shallow and wide, almost bowl shaped. Conduction mode welding simply heats the parts until the materials melt, flow together and solidify. In conduction mode welding, energy is coupled into the workpiece solely through heat conduction, and the heat conductivity of the materials limits the maximum weld depth, which typically ranges from only a few tenths of a millimeter to 1 millimeter. The width of a conduction weld is always greater than its depth, making the process well suited to joining thin-wall materials and spot welding. 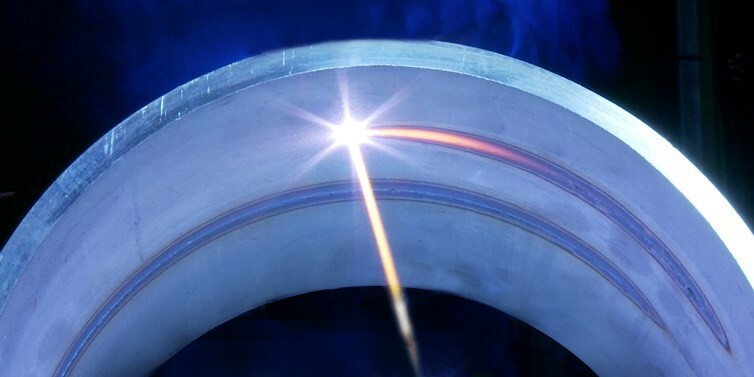 Conduction welding can be used for applications that require an aesthetically pleasing weld — laser conduction welds produce rounded, smooth bead that often don’t require extra grinding or finishing. Conduction mode welds are used to produce corner welds on the visible surfaces of electronics packages. Another common conduction mode weld application is in battery sealing, when particulates might be a concern. If the energy pumped into a conduction weld doesn’t dissipate quickly enough, the processing temperature can rise above the vaporization temperature. As material is vaporized, the weld depth sharply increases, and penetration welding starts occurring. This is termed a “transition” weld and typically has a width to depth ration of unity. Transition mode welds are common to pulsed Nd:YAG lasers, and used for many spot and seam welding applications. 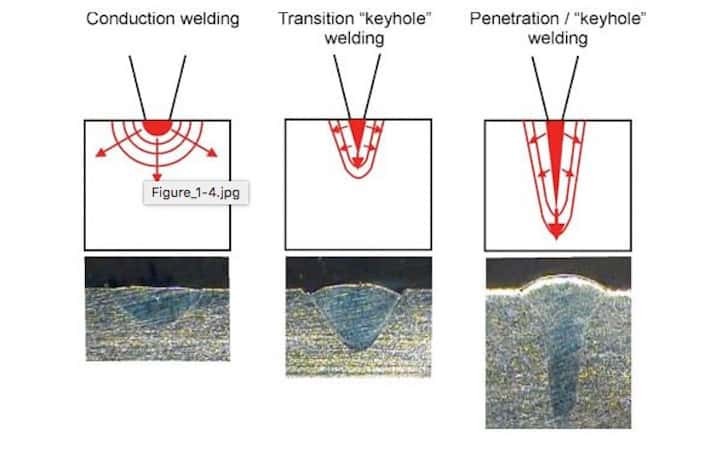 A keyhole mode weld has a deep, narrow profile with an aspect ratio greater than 1.5. The “keyhole” refers to a literal hole in the material, caused by its vaporization, which allows the energy beam to penetrate even more deeply. Energy is delivered very efficiently into the join, which maximized weld depth and minimizes the heat affected zone, which in turn limits part distortion. The keyhole is surrounded by molten metal that flows and fills the void as the beam travels through the material, sealing up the weld. Many factors have to be controlled and balanced to keep the keyhole from collapsing in such a manner as to halt the welding process or cause porosity, which are gas pockets in the weld that weaken it. Keyhole mode welds are incredibly strong and are indicated for deep penetration and structural welds. At EB Industries we use keyhole mode welding for applications like turbine blades, valves going into space, tank bearings, etc. 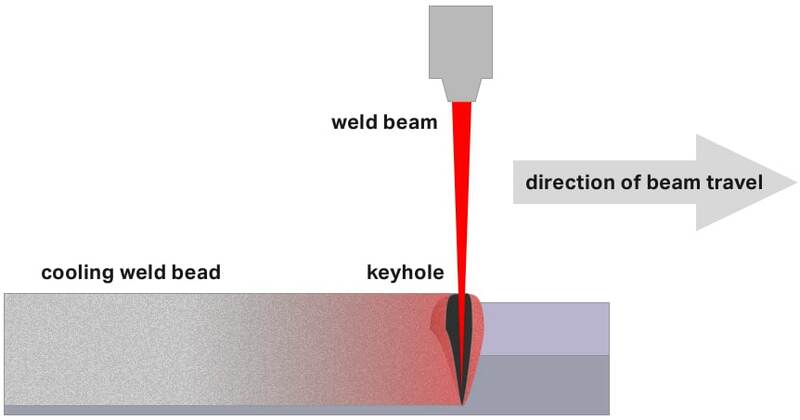 Both electron beam and lasers are capable of making high quality keyhole welds. Questions? Talk to our engineering staff at 1 (631) 293-8565. Have an requirement? Submit an RFQ by clicking below.